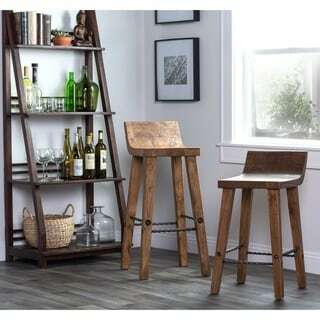 Create an earthy and natural vibe in your bar with this unique wood bar stool. Crafted of reclaimed elm wood and iron, this chair features clean lines for a polished look. The curved seat melds into a slanted back support, giving you comfort and stability. Update your bar seating and provide guests with a relaxing place to sip their cocktails or munch on breakfast. Note: This product will be shipped using Inside Home delivery. The product will be delivered to your door or the nearest ground-level entrance of your residence. Signature required upon delivery.